Emotional health rivals physical wellness in keeping the mind and body resilient. 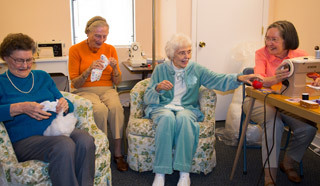 Indulge in a massage, a movie or join one of our Good Mood clubs or interest groups. Enjoy Sunday worship with the faithful or walk in our gardens to commune with nature. 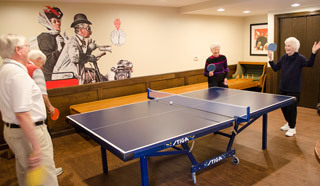 From in-house fitness programs to activities and special events, Grace Ridge Retirement Community brings Good Moods and good friends together. Giving back to others enlivens the mind, body and mood, so we honor that tradition with numerous ways for residents to get involved. Grace Ridge has opportunities for community involvement right here on campus, for instance, making toys for children in the hospital. We’ve also aligned the community with various nonprofits to provide volunteer opportunities for residents. Get involved by joining one of our resident committees, clubs or interest groups. Maybe playing bridge or billiards is your game. Maybe you’d enjoy hiking or bird-watching. Or dig deep with fellow gardeners who bring life to our raised flower and vegetable beds. You’ll not only get in a Good Mood, you’ll gain some new friends. 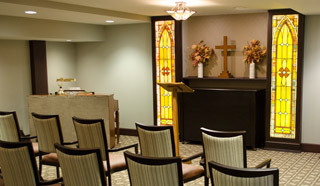 Grace Ridge Retirement Community welcomes people of all faiths for weekly worship services, gospel music and enlightenment in our onsite chapel. Residents are also invited to join our Spiritual Life Committee and take part in weekly prayer and Bible study groups that explore God’s grace.